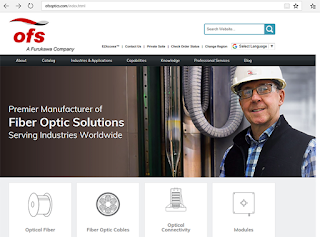 CommScope completed its previously announced acquisition of ARRIS International. CommScope said it expects to generate nearly $1 billion of cash flow from operations in the first complete year post-close, and expects to use the free cash flow to aggressively pay down debt. Through the completion of the transaction, CommScope has expanded its product offerings and R&D capabilities, with the combined company having approximately 15,000 patents and patent applications globally and approximately $800 million in average annualized R&D spending. 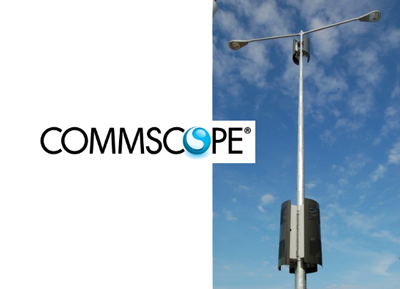 CommScope announced a "OneCell" C-RAN small cell solution for in-building 5G performance. The enhanced OneCell portfolio includes a new radio point platform, the multi-carrier RP5000 Series, which features software-programmable radios that can flexibly support new air interfaces to enable LTE-to-5G migration. Its supports cell virtualization, distributed MIMO (multiple input/multiple output), and granular location-awareness to support smarter services including emergency services. It uses off-the-shelf Ethernet LAN fronthaul infrastructure components to reduce cost and complexity for enterprise deployments. 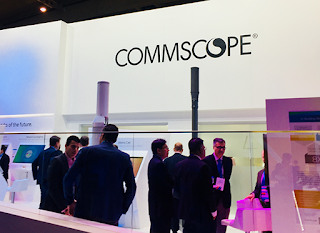 CommScope describes its OneCell is a 5G-ready in-building LTE solution that combines carrier-grade performance and reliability with deployment simplicity for single- and multi-operator environments. With OneCell, wireless operators and neutral hosts can fully participate in 5G-enabled services while preserving their investments in LTE. The company notes that many 5G target use cases – such as ultra-high definition video, industrial automation and “smart building” applications – will be deployed inside buildings. 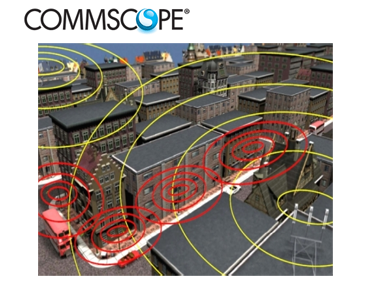 CommScope and Ericsson have successfully completed interoperability testing of their equipment for use in Citizens Broadband Radio Service (CBRS) deployments. Specifically, the interoperability test confirmed that CommScope’s Spectrum Access System (SAS) and Ericsson’s radio infrastructure with CBRS spectrum support will work together as part of a CBRS network. The companies said this SAS–Citizens Broadband Radio Service Device (CBSD) interoperability testing, which was the first using the Wireless Innovation Forum’s release 1.2 specifications, included a battery of scenarios to verify that both products meet governmental requirements and industry protocols, as well as CommScope’s and Ericsson’s respective quality standards. 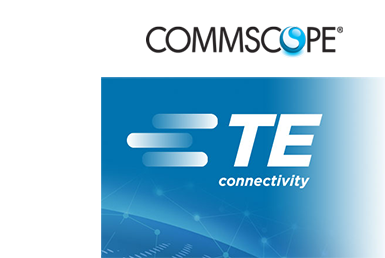 CommScope, a global provider of communications network infrastructure solutions, announced the introduction of a High Speed Migration platform, designed to help data centre managers as they seek to develop faster, more agile, high-density migration plans. CommScope's High Speed Migration portfolio is designed for duplex and parallel applications and allows customers to adopt the best approach to deliver the data centre architecture to meet their specific requirement. The offering is also designed to support higher speeds and emerging applications without the need to replace existing infrastructure. CommScope also has a team of network architects who are familiar with customer's business needs and can provide insight into future data centre and technology trends. 1. MPO connectivity options: 24-fibre connections that enable low initial cost duplex deployments with a single connection; 12-fibre solutions to support the expansion of legacy 12-fibre infrastructures; and 8-fibre to support QSFP technologies and addressing customers utilising the parallel optic configuration. 2. Fibre optic panels: ultra- and high-density panels designed to simplify management of duplex and parallel ports for dynamic migration and flexibility. 3. Ultra-low loss (ULL) performance: ULL pre-terminated components that enable longer link spans with increased connectivity options and support for attenuation-sensitive applications. 4. LazrSPEED WideBand OM5: part of the flagship SYSTIMAX portfolio, recently designated OM5 by the ISO/IEC, the products enhance the ability of short-wavelength division multiplexing to provide a four-fold increase in usable bandwidth while maintaining backward compatibility with legacy multimode fibre. 5. imVision: the automated infrastructure management system (AIM) that enables oversight and control of the SYSTIMAX physical network connectivity solutions. 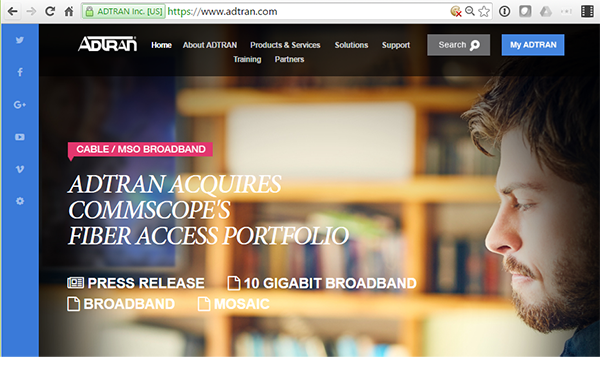 ADTRAN has acquired CommScope's key fiber access products, technologies and service relationships. Financial terms were not disclosed. Radio Frequency over Glass (RFoG) product line, including patented optical beat interference (OBI) mitigated versions. ADTRAN said it plans to leverage this HFC and FTTP bridging technology to help customers deliver high-bandwidth services and applications in specific situations, including rural and low-density greenfield deployments. 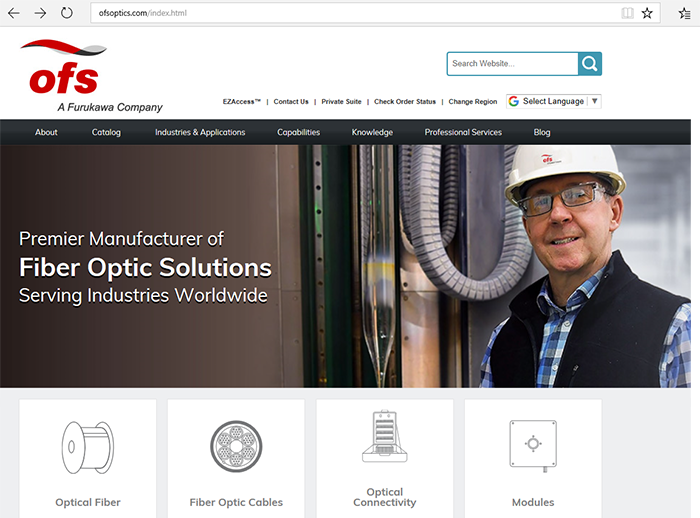 “The transition of these active product lines to ADTRAN sharpens both companies’ focus to benefit our customers and the cable industry as a whole,” said Jim Hughes, CommScope’s vice president of North American MSO sales. 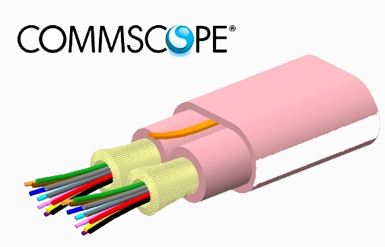 “As a global leader in fiber optics for wired and wireless networks, CommScope will continue providing passive PON solutions to the MSO and service provider market, including its optical closures, optical terminals and drops, and other passive accessories, along with its robust portfolio of innovative fiber-to-the-home (FTTH) offerings. 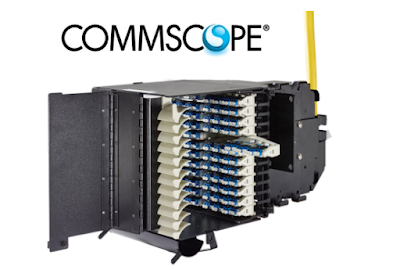 CommScope has significantly enhanced its Next Generation Frame (NGF) portfolio by introducing an Enhanced High Density NGF for data center owners and network operators. The new frame accommodates increased fiber density blocks to seamlessly add fiber terminations without requiring significant changes to the data center layout while conserving floor space. It measures seven feet in height and 24 inches in depth and can be installed directly next to existing traditional 30-inch wide NGF frames. The pre-terminated fiber blocks eliminate the need to individually plug in hundreds of connectors at the rear of the panel, thus replacing a large number of installation steps. Installers plug pre-terminated MPO assemblies directly into modules at the rear, which distribute trunk fibers into 10G or 40G channels at the front. All pre-populated blocks are factory tested, assembled, and packaged to provide maximum craft friendliness. Pre-terminated blocks with cable stubs are also available. 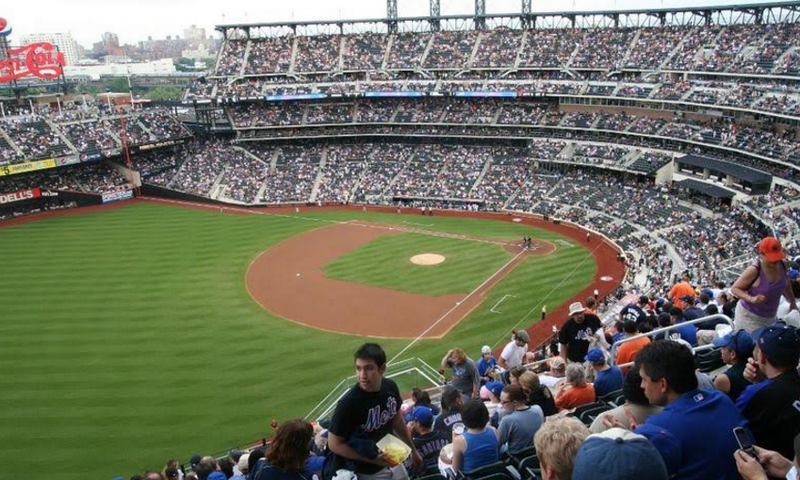 The Citi Field ballpark in New York is using a multi-operator digital distributed antenna system (DAS) supplied by CommScope. 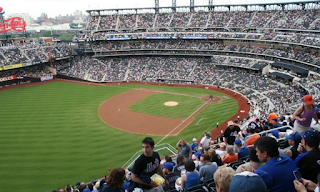 The CommScope FlexWave Prism and InterReach Fusion system deployed at Citi Field provides 850 MHz, 1900 MHz, AWS, and 700 MHz frequencies to deliver 3G and 4G mobile services for fans at the 41,000-seat stadium. The deployment covers the stadium seating areas, luxury boxes, walkways and parking areas at the ballpark in Queens. FlexWave Prism features modular, high-power remote units to deliver the performance and frequency bands needed in each location. The InterReach Fusion system is a low-power solution that delivers strategic and pin-point services to interior portions of the stadium. CommScope demonstrated 100 Gbps Ethernet applications using short wavelength division multiplexing (SWDM) over wide band multimode fiber (WBMMF). The technology is targeted at high bandwidth applications in high-performance data centers. The demonstration at this week's OFC in Los Angeles was held in partnership with Finisar, which supplied the 100G transceivers for use with the CommScope LazrSPEED 550 WideBand multimode fiber. 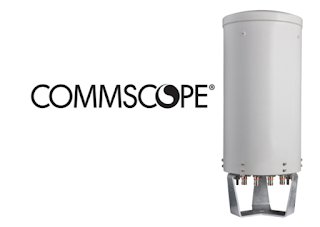 CommScope introduced a new Metro Cell Concealment Solution that features a two-piece design for mounting all the necessary equipment for metro cell operation. Two can mount and hide radios, antennas, backhaul termination (wireline or wireless), back-up batteries and other equipment on street poles in units that are more structurally balanced and easier to permit. 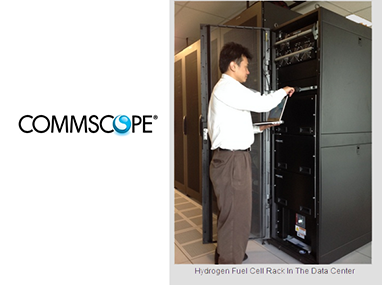 CommScope announced a partnership with Hydrogenics to offer an indoor, fuel cell solution that can provide back-up power in a data center. The scalable, hydrogen fuel cell solution can provide up to 30 kilowatts (kW) of reliable, environmentally-friendly backup power to enterprise computing systems. 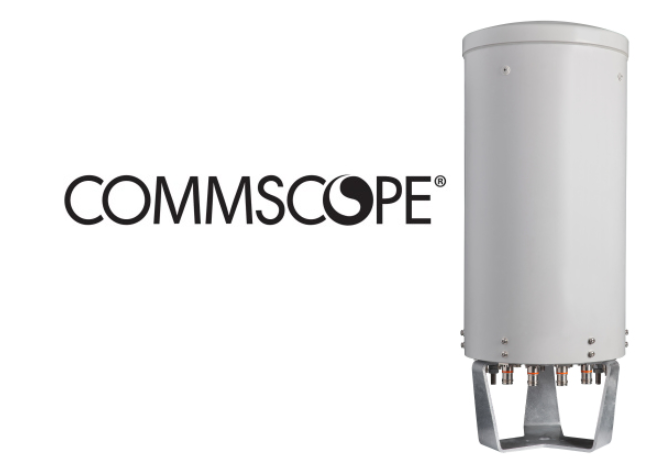 Commscope said multiple power racks can be installed to scale in 30kW increments and sustain a variable runtime from hours to days, based on customer requirements and hydrogen tank options. The unit has the width of a standard server cabinet. CommScope said that while deployments of outdoor fuel cells are taking off, it believes this indoor fuel cell is first-to-market. 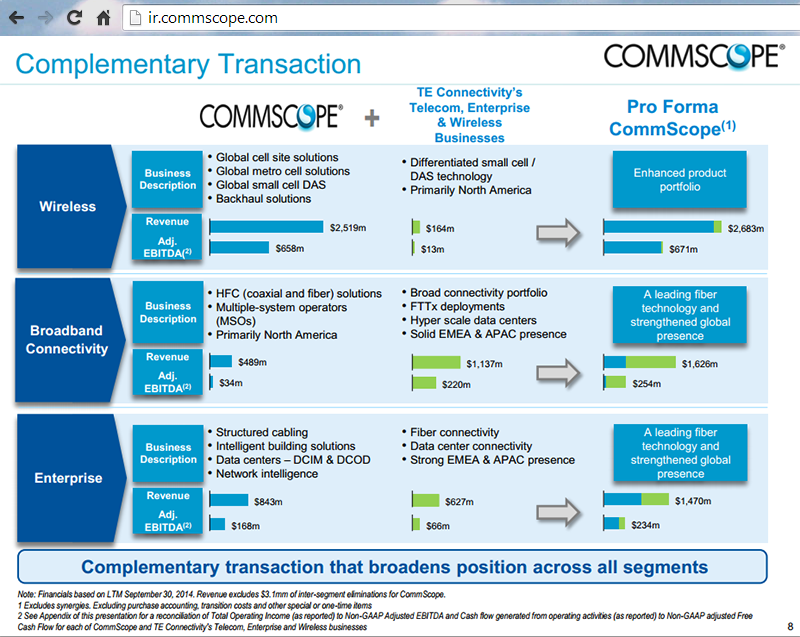 CommScope, which supplies connectivity and essential infrastructure solutions for wireless, business enterprise and residential broadband networks, boosted its sales and earnings guidance for the first quarter of 2014. The company cited stronger sales with mobile operators. Sales of $900 million to $925 million, up 13 percent year over year at the midpoint of the range. Adjusted operating income of $175 million to $185 million, up 36 percent year over year at the midpoint of the range. Adjusted earnings per diluted share of $0.43 to $0.47, up 29 percent year over year at the midpoint of the range. The first quarter earnings range assumes 191 million weighted average diluted shares outstanding.